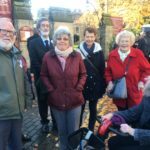 Amongst the huge crowd at the Remembrance Sunday ceremony in Leighton Buzzard on 11.11.18 were a small group of Quakers who had come to witness for peace and to lay a wreath of red and white poppies. 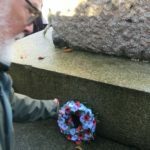 Though there was long list of those who were to lay wreaths, The Religious Society of Friends (Quakers) was not mentioned. 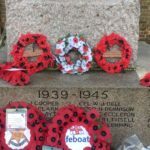 But the wreath was laid anyway. 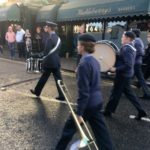 The ceremony was dominated by a militaristic parade, with standard bearers of all ages, from war veterans to Brownies. 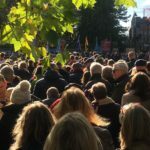 There were a few in the crowd wearing white poppies, or both white and red poppies. Here are some of the photographs taken on the day.